The black EPH-M100 In-Ear Headphones with Remote and Mic from Yamaha delivers full-range sound with powerful bass, clear mids and crisp, sparkling highs. Its lightweight, ergonomic design provides a comfortable fit and a tangle-resistant cable offers a built-in remote/mic. The headphones use 15mm drivers that are installed close to the tip of the housing. This allows the driver to be closer to the eardrum and in a straighter orientation than standard in-ear headphones, reducing reflected sound for a pure and accurate music experience with low distortion. 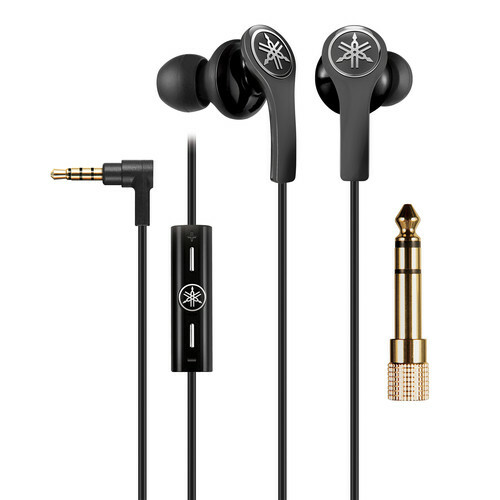 The headphones come with 5 different sizes of eartips so you can find the best fit for your ear. A soft carrying case is included for convenient transportation and storage. Box Dimensions (LxWxH) 8.11 x 4.961 x 2.52"